This Friday sees us kick off a weekend double-header of gigs with a performance at The Occasions Suite in Montrose, where you can enjoy a supper as well as two sets of music. Then we’ll be hot footing it to Glasgow on Saturday for a special performance at a wedding. Details of the Montrose gig are available on the CONCERTS page. Looking ahead to May, we’d like to mention a special event we’ll be playing in Edinburgh on the 12th, Carry On for Kelly. The show will feature music & comedy, and is part of a campaign to raise funds for St. Columba’s Hospice and remember a dear friend, Kelly Murphy, for whom the hospice did so much. Another fantastic and thoroughly enjoyable Edinburgh Festival Fringe has come to an end and we’d like to offer massive thanks to all of you who came out to see us – almost 1 and a half thousand of you over the run! It was lovely to play some new songs for you and to give an airing to some we haven’t done in a while, as well as sharing a host of old favourites too. We look forward to doing it all again next year! There is a lot to be packed in before then of course, and the diary is already filling up with dates. First up is a trip to Fort William to play the Ben Nevis Hotel on Friday 1st September. This will be our first gig in Fort William in about 7 years so we’re really looking forward to it, and it looks like being something a bit special. The evening has been organised in conjunction with the Royal Scottish Country Dance Society and will not only include two sets from us but also a short ceilidh set from Angela Young, perfect for those of you who fancy stretching your legs in between our sets! Tickets will be available on the door, or you can get in touch with us through the CONTACT page or through FACEBOOK to reserve a ticket. As spring gives way to summer it’s great to look back on an event-filled few months which has seen us perform in all sorts of venues from the likes of the New Club in Edinburgh to the Thomas Paine Chapel in Sussex, from Canal View Primary School in Wester Hailes, to Scotland’s National Stadium – Hampden Park – in Glasgow. You can see a selection of snaps from the gigs above (thanks to Stephen, Wendy, Mel, Lee and Ross for the photos). This summer is set to be just as busy as we prepare for our 9th consecutive year at the Edinburgh Festival Fringe. This year sees the Fringe celebrate its 70th anniversary, and for us it will involve more performances than ever before with 18 shows at the Quaker Meeting House (4.30pm, 7th – 26th Aug, except Sundays) and a further 4 evening shows at The Jazz Bar (8.30pm, 12th / 13th / 18th / 19th Aug). Full details are available on the CONCERTS page, tickets for all shows are on sale now. 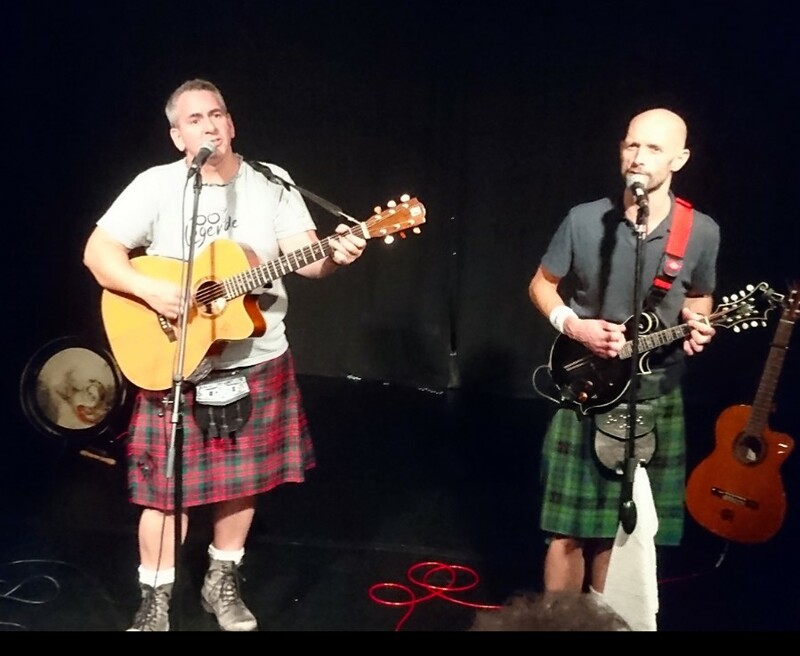 Following a busy month or so which saw us giving a talk to the Edinburgh Sir Walter Scott Club and playing shows in Bridgehouse, Yetholm and Dundee, it’s almost time for us to head south for our appearances at the Brighton Fringe. We’ve had a month or so off after the activity at the start of the year, but are now gearing up for a busy period. Next up is a special talk we’re doing for The Edinburgh Sir Walter Scott Club on 20th April. The talk will be similar in format to our podcast The Scottish Song Guide and will see us discuss and perform some of the songs written or collected by Scott. Appropriately enough the venue is Edinburgh’s New Club – situated across Princes Street from The Scott Monument. Two days later (22nd April) we will be at Bridgehouse Hall in West Lothian and then on the 6th May it’s off to the Borders as we play in Town Yetholm, by Kelso. We then have a private event in Dundee before heading south of the border for the first time for a three-date run at the Brighton Fringe (26th-28th May). We’re very excited to be taking our show to England’s biggest arts festival and hope that the Fringe-goers in the south east will appreciate us as much as those in Edinburgh do every August! For full details of all upcoming concerts and for details of how to buy tickets, please visit the CONCERTS page. A belated Happy New Year to you all, and first up a big thank you to Chris & all at The Magnum, and to those of you who came along on Hogmanay to see in the New Year with us. We had a cracking night, a fabulous way to celebrate our 10th anniversary and a great start to what looks like being a busy 2017! Full details will be available on the Concerts page as time goes on, but for the first few months of the year we already have shows planned in Fife, West Lothian and the Borders, a talk on the songs of Walter Scott for The Scott Club in Edinburgh and some school workshops around Burns Night. Keep up with all the latest happenings here or on our Facebook page, and don’t forget you can hear all the latest episodes of our our podcast, The Scottish Song Guide, by following the link on this site. As mentioned a few weeks back, we are delighted to be celebrating the 10th anniversary of our very first gig with a performance this Hogmanay at The MAGNUM, situated in the heart of Edinburgh’s New Town. Entry will be FREE, but as the event is non-ticketed and likely to be busy it’s advisable to arrive well in advance of The Bells to be sure of getting in. We’ll play a first, short set around 11pm, and will then begin our main set a little after midnight. Dinner will be served until approximately 10pm so if you’d like to eat beforehand please call The Magnum to book.